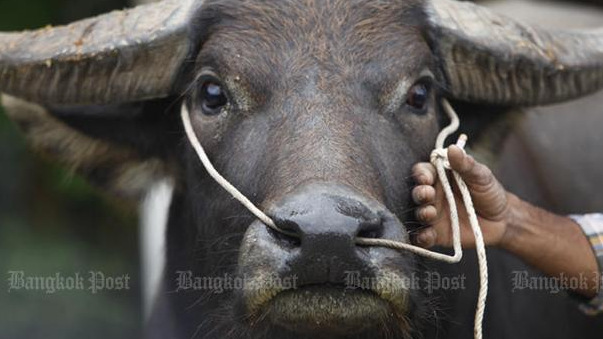 BANGKOK: A buffalo held as evidence in police custody has shown signs of depression at its new temporary home in the compound of the Kannayao Police Station. On the second day away from its friends and field, the buffalo, named Thong Kham, looked sad yesterday (Nov 28) – although it was well-behaved and did not have health problems, police station chief Col Sing Sinhadej was quoted as saying by Daily News online. Col Sing said he had consulted a vet and was told that it was a normal emotion for any animal parted from its friends. Thong Kham was trying to adjust to its new environment after being separated from two other buffalo living at the house of Surat Phaewket in Tambon Suk Duen Ha in Chai Nat’s Nuen Kham district. 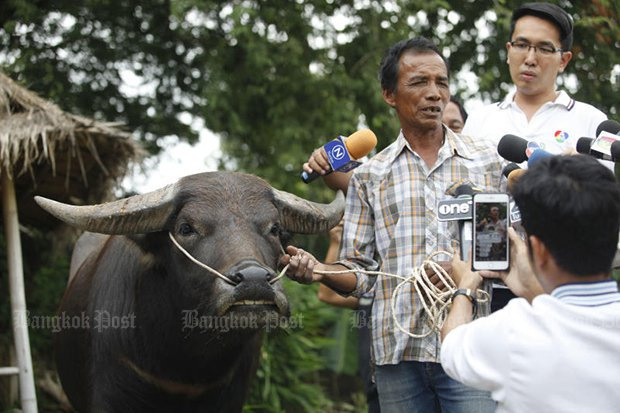 Now probably the most popular bovine celebrity in the country, Thong Kham was transported on a pickup truck from Chai Nat to the police station in Kannayao District of Bangkok on Tuesday. It has been penned in an area close to a small farm on the station premises. The bewildered buffalo might not fully appraise the reason for its sudden relocation, but police insist it was necessary for the pursuit of justice. Investigators are keeping the buffalo as evidence after famous lawyer Songkan Atchariyasap filed a complaint with the Kannayao Police on Tuesday, asking them to take action against Mr Surat. Mr Surat was paid to take care of the animal in Chai Nat by owner Boonlert Kanpakdi, chief of the Suk Duen Ha Tambon Administration Organisation (OrBorTor). The caretaker had posted pictures of himself and Thong Kham on his Facebook page asking netizens to donate money to save its life, claiming that the owner planned to send the buffalo to a slaughterhouse. More than 100,000 baht from donors, including the money contributed by Mr Songkan, poured into his bank account – enough to buy Thong Kham. Mr Boonlert then denied the story, saying he had no intention of sending the buffalo to the dinner table as Mr Surat claimed. Mr Surat was hired to take care of the animal as his house was flooded, Mr Boonlert said, and he was keeping the animal as breeding stock. Caretaker Surat faces four charges of fraud, violating the Computer Crime Act, deceiving people into donating money and laundering money. After Kannayao Police accepted the complaint from Mr Songkan, they went to Mr Surat’s house in the district where he tended the buffalo and took the animal away to Bangkok, accompanied by the owner. “My family and I were shocked. We did not expect police would do this,” Mr Surat said at his home on Tuesday. Mr Surat said he did not plan to pocket the donations and claimed that the problem was a misunderstanding as he believed the owner had agreed to sell Thong Kham to him for B130,000. He said yesterday that he was willing to return all the donors’ money. Kannayao Police asked him to meet investigators in Bangkok to hear the charges. He has not yet complied, and police repeated on Wednesday that may issue an arrest warrant for him if he does not show up. Mr Surat said yesterday that he was not fleeing justice and needed a lawyer to go with him. He also promised full cooperation with authorities to see the conflict end as soon as possible, he added. Police have not said how long Thong Kham will be detained, far from his home. LOL...what a goose. Is this really a serious publication? Aaahh,K's  alter ego has spoken.